This was inspired by a recipe in the Sunday Times Style Magazine over 10 years ago. It is something I used to make fairly frequently back when eating things like cream on a regular basis didn't go straight to my hips. This is the first time I've made it in over five years, as a starter when a friend came over for dinner. I'd forgotten how much I enjoyed eating it. I hope you'll enjoy it too, and not think too hard about the cream or your hips. Preheat the oven to 180°C, then while the oven is heating up, pour the single cream into a saucepan. Crush in the garlic and shred the basil leaves then simmer until reduced by a third. Slice the tomatoes in half lengthways and remove the seeds then put cut side facing up into a baking dish and season with a little salt and pepper. Pour the cream over the tomatoes and then bake in the oven for 20-25 minutes. 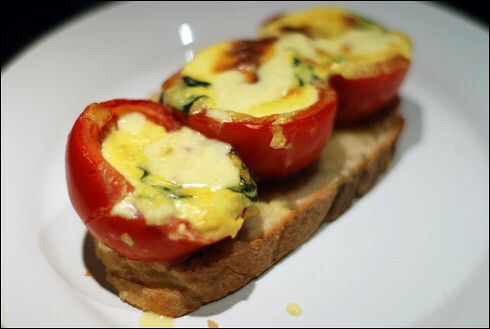 Just before the tomatoes are ready, toast the bread, place on four plates then drizzle with a little olive oil. When the tomatoes are done, put three tomato halves on each slice, spoon any leftover cream in the baking dish over the top and serve.